High score pushing games aren’t something we’ve seen a lot of yet on the Nintendo Switch, and Neon Caves is a small frenetic game ready for that genre space. As far as titles go, this one’s on the nose too. You’ll be in a cave…and there will be neon things. That’s really all of the premise needed for this twitchy shooter. But does it hold up to the likes of Graceful Explosion Machine or Pac-Man Championship Edition 2 Plus? 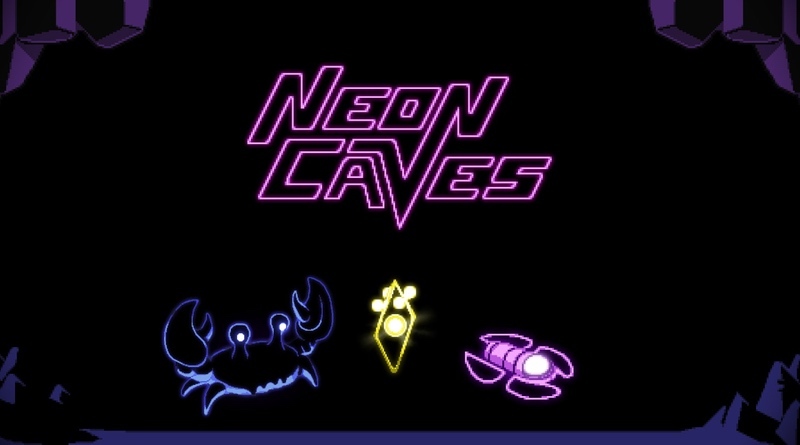 In Neon Caves, you’ll command a ship with the sole purpose of stabilizing a cave and ridding it of unwanted critters and inhabitants. Your craft comes equipped with a sweet anchoring mechanic that allows you to stick in place for a few moments, turning into more of a stationary turret gun. When not engaging that tool, you’ll have to shoot your weapon to propel yourself around the screen. While this may sound easy on paper, there’s actually a large challenge in learning how to do this with any sort of accuracy. Shooting, anchoring, and moving around is the foundation of the game, and there’s a lot of skill to be mastered if you want to achieve a high score. The name of the game in Neon Caves is definitely High Score. With a global leaderboard displaying after every death, the game tallies you on kills, number of rounds you survived, among some other stats and then gives you a ranking placement against everyone else who has played. I personally felt proud to have survived past round 5 myself as the screen becomes a visual cluster of brightly colored neon things all swarming my ship in a relatively short amount of time. Death tends to be swift (at least in my attempts), so I did find enjoyment seeing my leaderboard placement jump a notch or two after a slightly more successful run. Since there’s such a strong emphasis on neon aesthetics with this title, I was having trouble placing what the overall art style felt like to me, until I realized it reminded me a lot of the old 1990s handheld toys. The ones with a static art background and the actual game overlaid on top (Game and Watch is one example). In Neon Caves, the background is a static cave image, and you’re playing across the screen space with no gameplay taking place in any sort of 3D depth. The neon creatures and your ship also have soft muted glows furthering that classic arcade look. It’s a style that’s minimalistic, but works cohesively for the most part. My largest complaint though is that my ship didn’t feel as though it stood out in contrast to other creatures and therefore I was oftentimes losing focus as to where I was on-screen when things got a bit more chaotic. Games like Geometry Wars that are similar in genre used light trails or other elements to put emphasis on the player’s ship against surrounding elements, and I feel this game could use that too. I also found (which is rare for me) that I disliked some of the default settings and felt forced to make some adjustments. In particular, the Nintendo Switch vibration, while nifty, became pretty overwhelming in this game as it was going off constantly. So I went ahead and disabled that pretty quickly. While I enjoyed the soundtrack, I did find the warning sound effect that comes with imminent collapse of the cave to be pitched incredibly high and loud, so much that my Nintendo Switch speaker was starting to crackle. I’d love to hear this effect replaced, but in the meantime, I turned off the sound effects. While in the Options Menu, I did stumble upon a rather interesting tick box entitled “Vlambeer” Mode. Likely in reference to the developer of games like Nuclear Throne, enabling this made for a monstrously swimmy camera and so I quickly reverted that myself. Despite some of these flaws, Neon Caves is a nifty little game that’s quite challenging. It originally debuted back on the Ouya platform circa 2014 and so it’s interesting to see it make the leap anew to the Nintendo Switch. Personally, I burned out on this game pretty quick, much akin to games like Flappy Bird on mobile or Timber Man Vs on The Switch. Still, if you’re of the highly competitive nature, there’s a game to be mastered with Neon Caves. Neon Caves is a retro looking twitch 2D shooter that’s all about getting the highest score and surviving inside a cave warding off its inhabitants as long as possible. Armed with a ship, some weapons, and anchor ability, gameplay is simple to understand but pretty difficult to master. For the $3.99 price tag, it may feel steep for people used to playing these sorts of high score games on mobile devices, but it’s priced competitively for the Nintendo Switch.